Ammannsville is a tiny community located about nine miles southeast of La Grange. German and Czech immigrant farmers first settled in this region in the 1870s. The town is named after Andrew Ammann who just happened to be the first settler to arrive on March 12, 1870. 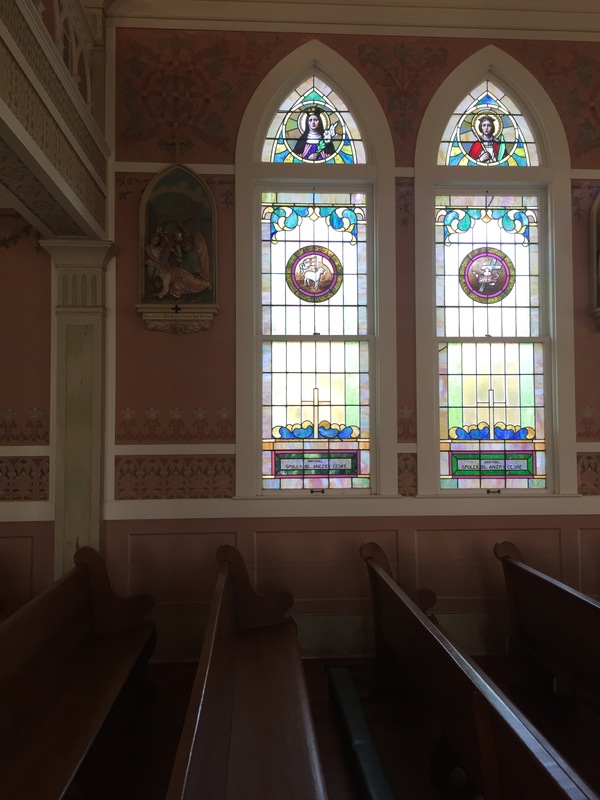 Ammannsville is also home to St. John the Baptist Catholic Church, also known as the Pink Church — one of the Lone Star State’s historic painted churches. This church opened its doors in 1890 and served the people of the area until it was destroyed by the Velasco Hurricane of 1909. The second church to occupy the site was built by Leo Dielmann, the young German architect who designed and built the beautiful St. Mary’s Catholic Church in High Hill. Architectural plans and photographs on file at the Dielmann archives in San Antonio reveal that this second structure had a beautifully ornate interior, much like St. Mary’s church. Sadly, the second church building was destroyed by fire eight years after it was built. One woman, who was just a child at the time of the fire, recalled that the fire was so intense that it melted the church bells. When folks saw the smoke, she said, they raced to the church to try to save it. Only a few of church’s statues escaped the flames. 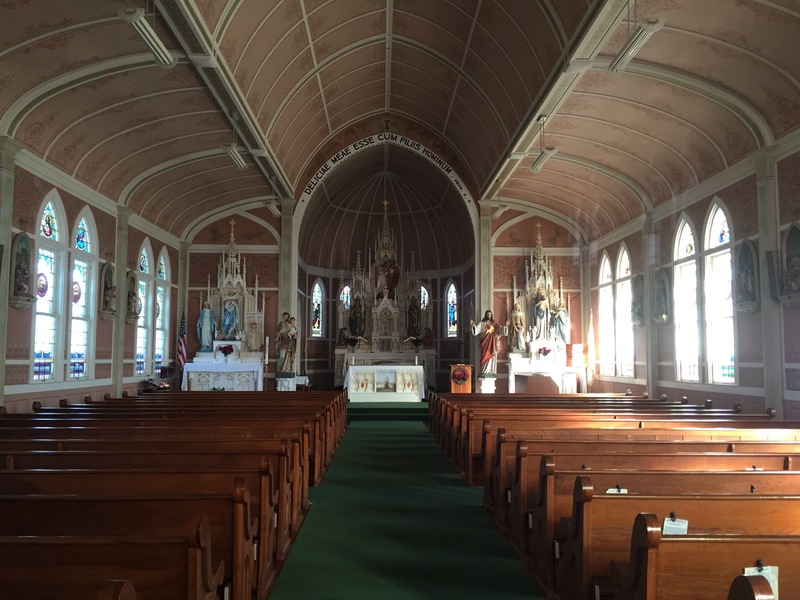 The people of Ammannsville, determined to have their place of worship, immediately made plans to rebuild their beloved church on the same site. This third church was completed in 1909. Although the interior is beautiful, it is less ornate than that of the previous structure. The interior, sans columns, is open and bathed by the natural light that pours in through the large windows. While the exterior of the church is white, the interior is painted in a rosy pink color — thus the name, The Pink Church. According to a legend, an unknown artist painted and embellished the interior of the church and then vanished, never to be seen again. Although the legend adds an aura of mystery to the church’s interesting history, the community actually hired a painter named Fred Donecker. 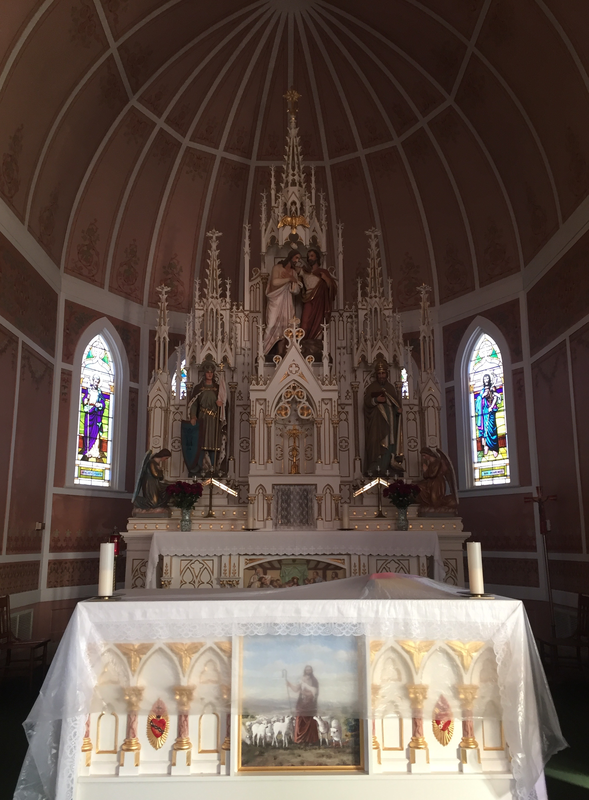 Little is known about this decorative painter who is believed to have also painted the Catholic Church in Moravia, Texas. Like the other painted churches in the area, St. John the Baptist Catholic Church has a beautiful and worshipful interior. The altar is a masterpiece of carpentry. The walls on either side are adorned with the familiar stations of the cross that portray the events of the Passion of Christ. 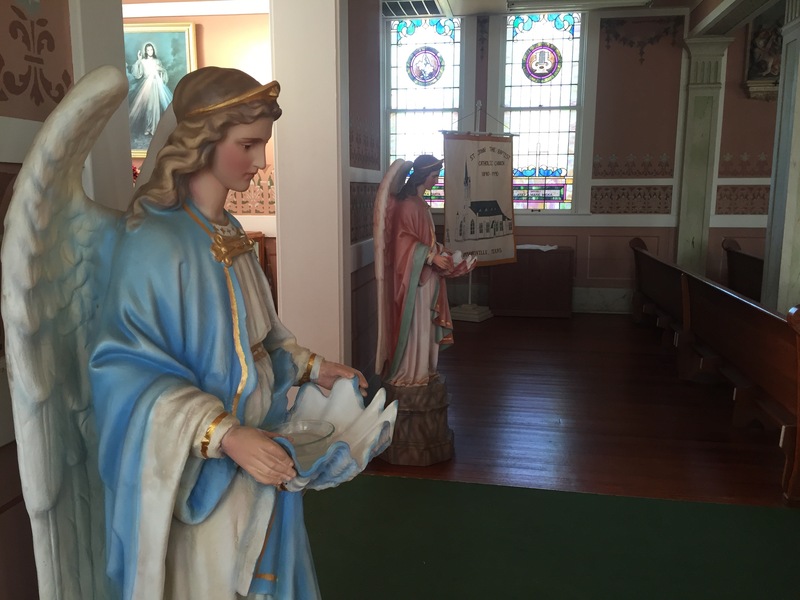 The welcoming angel statues at the entrance of the church hold sea shell shaped containers of holy water for those who come to pray and worship. St. John the Baptist Catholic Church was added to the National Register of Historic Places in 1983. 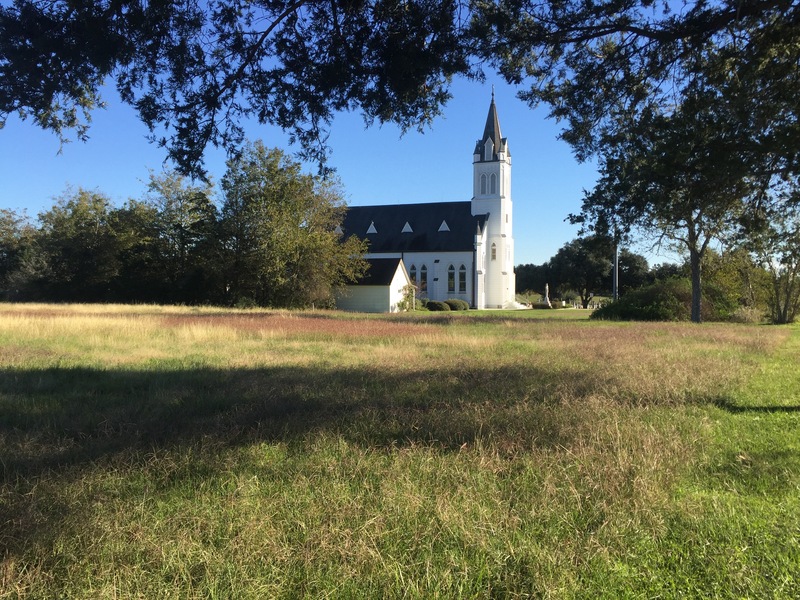 The church is open daily to visitors who venture off busy Interstate 10 or who meander down the surrounding farm to market roads. Set your GPS to Ammannsville — that’s all the address you need. You can’t miss the church. It’s the tallest structure in the area, and the most beautiful. This entry was posted in Churches and Missions, Painted Churches of Texas and tagged Painted Churches of Texas, St. John the Baptist Catholic Church, The Pink Church of Ammannsville. Bookmark the permalink.